Argentina crashed out of the World Cup, but the face of Lionel Messi will still be featured on Chinese TV screens during the championships than the face of any other player. In a prime-time advertisement, he lies face-up on the football field, wearing a hard-to-read expression－some say tired and fulfilled, others say sad and confused. "I was not born to be strong. I have been fighting to be strong," goes the voiceover. Messi is advertising for Mengniu, a dairy producer based in North China's Inner Mongolia autonomous region, and the advertisement is broadcast repeatedly before matches, at halftime and after the games. Chinese businesses have invested heavily in the World Cup, and television viewers have been surprised to find advertising boards with large-sized Chinese characters surrounding football fields. Many of the English-language boards feature Chinese companies, including electronics producers, fashion brands and even an e-bike maker. "I often have the feeling that I am watching a match of the Guangzhou Evergrande Taobao team back home in the China Super League," said Ma Chao, a Chinese fan who travelled to Moscow for the World Cup. "All these familiar brands are there on the football field. With me in Moscow, there are 60,000 Chinese fans. We are eating the 100,000 crawfish that have travelled the Sino-Europe railway to get here. All that is missing is the Chinese football team." Businesses no doubt comprise the biggest part of the Chinese presence. Seven Chinese companies have signed to be World Cup partners, sponsors and supporters in Moscow. Their sponsorship has reached US$835 million (S$1.14 million), which is more than one-third of the event's total revenue from sponsors. The amount is US$400 million more than the second-biggest spender, the United States, and easily exceeds that of host country Russia, according to market research company Zenith. Chinese businesses say they want to increase the influence of their brands in foreign markets through the sponsorship, while experts say brand-building is only a small token for success in global expansion. They include property/entertainment conglomerate Dalian Wanda Group, home appliance maker Hisense, dairy producer Mengniu, smartphone maker Vivo, e-bike maker Yadea Technology Group, technology and entertainment company Luci and menswear brand Diking. There was only one Chinese sponsor at the World Cup in South Africa eight years ago, when solar panel maker Yingli Group became the first Chinese company to do so. Franck Guignery, head of sales at FIFA, said the organisation is excited about the prospect of engaging Chinese fans and sponsors on a level never seen before as China experiences a surge of interest in football. As China's only top-level sponsor of the 2018 FIFA World Cup, Wanda said it is seizing opportunities brought by the world's most popular sports event to "grow global understanding and awareness of the Wanda brand", adding that it has signed up as a long-term partner of all FIFA events until 2030. "Wanda has long been devoted to delivering rich experiences to football fans in China and all over the world," said Yang Hengming, president of Wanda Sports Group. "One of the primary reasons for us to sign the partnership with FIFA was to inspire the next generation of Chinese football players." Hisense, based in Qingdao, Shandong province, is one company that has seen sales pick up in Russia as the result of World Cup promotions. "We believe that the World Cup will greatly improve global awareness and economic value for Hisense," said Liu Hongxin, president of the group. Sponsoring the prestigious event serves not only as a massive marketing opportunity for the brand, but also as a crucial, strategic initiative for the entire enterprise, he said. Hisense's logo has been shown on LED advertising boards at World Cup stadiums in 11 cities in Russia, including Moscow, Saint Petersburg and Sochi. And the input has paid off. Hisense's TV sales in Russia have witnessed explosive growth in the past half month, rising by 300 per cent year-on-year. The company was an official partner at UEFA Euro 2016 and a team supplier to Red Bull Racing. It also sponsored the Australian Open tennis championships in 2014 and other top sports events. Liu said the company has made sports marketing a priority in its long-term strategy. "Over the years, Hisense has earned a lot of experience and brand growth through sports sponsorships," he said. The growing presence of Chinese companies at the World Cup can be seen against a backdrop of declining interest in the tournament from traditional Western backers amid the financial aftershocks of FIFA's corruption scandals. Whether such big spending by Chinese companies will translate into better international brand awareness and sales remains to be seen. 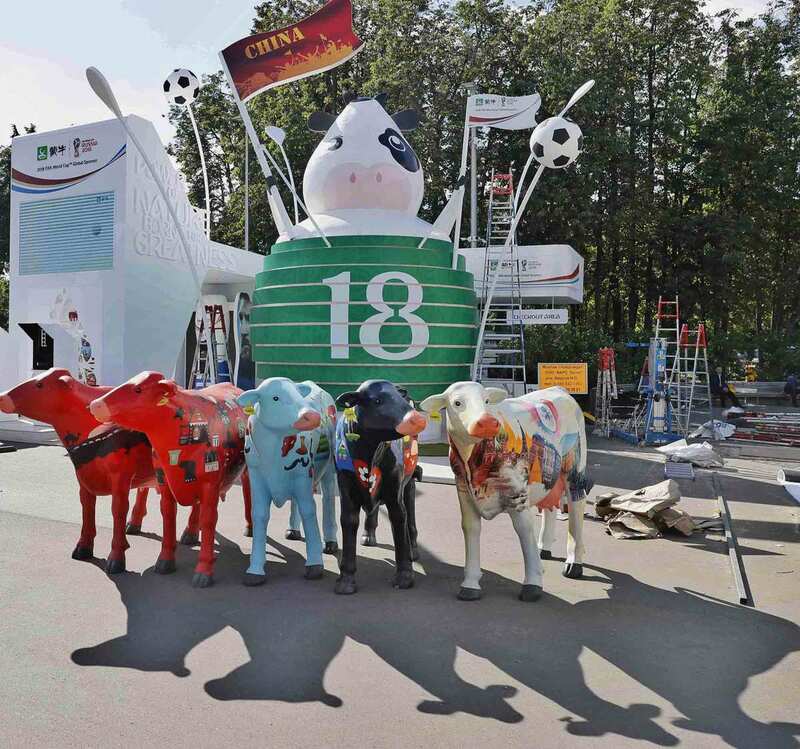 But even though the final numbers are not yet in, Chinese companies say sponsoring the World Cup remains a good deal. Deng Li, brand vice-president of Vivo, said sponsorship of major sports events and leagues has already contributed to Vivo's growth in China and facilitated its global expansion. "The World Cup, which only happens once every four years, will play an equally important, if not bigger, role," Deng said. The company signed a six-year sponsorship agreement with FIFA last year that will run until 2022 and includes sponsorship of the 2018 and 2022 World Cups. Vivo's latest flagship smartphone, the NEX, started selling on June 23, and sold out on its website within just four hours, the company said. James Yan, research director at market research company Counterpoint, said that by sponsoring the World Cup, Chinese companies can boost their branding influence among foreign consumers, which will lay down a sound base for them to negotiate with local retailers. "It makes real business sense," he said. Dong Min, vice-president of All View Cloud, a Beijing consultancy which specializes in home appliances, said sponsoring such top sports events will definitely increase a brand's global profile and boost overall sales. Dong added that Chinese brands clearly recognise the importance of such a strategy. He Wenyi, executive director of Peking University's China Institute for Sports Value, said Chinese companies can afford the cost because they have a huge market behind them to support the pace of globalisation, and it is a historic moment and a natural choice for Chinese companies to join the sponsors' club. Liang Zhenpeng, an independent consumer electronics analyst, said appearing at top international sports events reflects Chinese companies' strategy of overseas expansion, but they should do more to achieve globalisation. "Sponsoring the World Cup is just one step of overseas expansion," he said. "What Chinese enterprises should do is to enhance the quality and technology level of their products, as well as improve aftersale services and users' experience to lure global consumers." Liang added that Chinese enterprises should also expand in the industrial chain and increase investment in research and development of core technologies.